"Manati!" 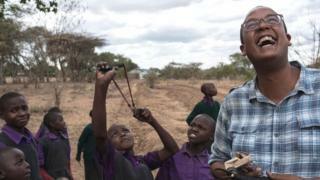 A hundred pairs of eyes widen as Teddy Kinyanjui pulls out a makeshift catapult (or 'manati' in Swahili) to show children at Kwamwatu Primary School today's nature lesson. Teddy explains the importance of trees as food, shelter and fuel but also how they protect crops and plants from the wind and soil erosion that is turning Machakos county and much of Kenya into a dustbowl. Teddy is co-founder of Seedballs Kenya. He holds up a small, black marble-sized pellet: a single tree seed coated in a charcoal shell to stop it from being eaten by insects and animals. These "seedballs" will be their ammunition for the afternoon as they replant trees and grass in the barren grounds of their small school. It is currently the dry season but once the rains come, the water will wash away the coating and the seeds will germinate. "One seedball has the potential to grow another million trees because if it becomes a mother tree in one area that's been over-exploited and very degraded, it will start re-seeding some of these places," says Teddy. He sets up a catapult contest outside, and hangs an empty seedball packet on a branch of one of the few trees as a target. Excited children laugh and cheer as they take their turns. Even the headmaster has a go. Replanting a school's grounds may be child's play but replanting a country is a mammoth task. Kenya is estimated to be cutting down 5.6 million trees and shrubs a year according to the Green Africa Foundation. "Aeroplanes and helicopters are probably the only way to get the job done quickly and in this day and age with GPS guidance and precision technology you can get things to exactly where you need to: so the right seed in the right place, at the right time," says Teddy. He has persuaded a number of helicopter charter companies to keep bags of seedballs under the seats so passengers can join the push to reforest Kenya. His own fingers are black from throwing seedballs out of the open door of a helicopter. "We just planted 20,000 tree seeds in less than 20 minutes," he smiles. "It means that you can lower the cost of tree planting incredibly compared to the traditional method of digging holes and transporting seedlings." "The scale of the problem in Kenya is absolutely incredible," says Teddy. "There are tens of millions of acres that have really been degraded and are coming to a tipping point almost of no return in terms of being able to support human and animal life." Flying over the Ngong Hills, we catch the increasingly rare sight of giraffes running gracefully below. In 2016, the International Union for Conservation of Nature, added giraffes to its list of animals vulnerable to extinction. Nearby we can see the main cause: hundreds of felled trees. The IUCN lists loss of habitat as the top reason for the declining giraffe population. Down the road from the primary school a group of villagers are hard at work replanting trees around their communal plot or shamba. Millions of Kenyans rely on these village allotments for staple foods such as maize. Logging, mostly for charcoal, the main local fuel, has left the land vulnerable to high winds and drought which in turn have dried the earth and leached it of nutrients. The truck throws up clouds of deep orange dust as we drive past dead trees and shrubs. Ruth Kitana is one of about 20 villagers gathered to work on the reforestation project run by the charity World Vision Kenya and a local government agency. "The harvest was so poor that we only had enough for a short time, she tells us. "There was nothing left over.... we have to buy things like maize flour and maize from the market now." About half the seedballs will germinate to become mature trees. And there is evidence that native tree species such as acacias grow stronger, more extensive root systems than those grown in a pot and transplanted. The stronger roots should make the tree more resilient to drought and extreme weather as well as anchoring the earth to stop further soil erosion. Ruth hopes that within five years her home will be green again and her crops will thrive once more. And, in time, Teddy hopes they can provide a new source of income to farmers like Ruth. Seedballs Kenya has just started exporting seedballs to Congo and Teddy hopes, in time, they will help reforest arid areas around the world. "My dream for Seedballs Kenya is to make a positive change at a cost we can afford."